Apple wrapped up its 2013 fiscal year Monday with a $7.5 billion profit on $37.5 billion in revenue, reporting accelerating growth buttressed by strong iPhone sales and growth in the Chinese market. 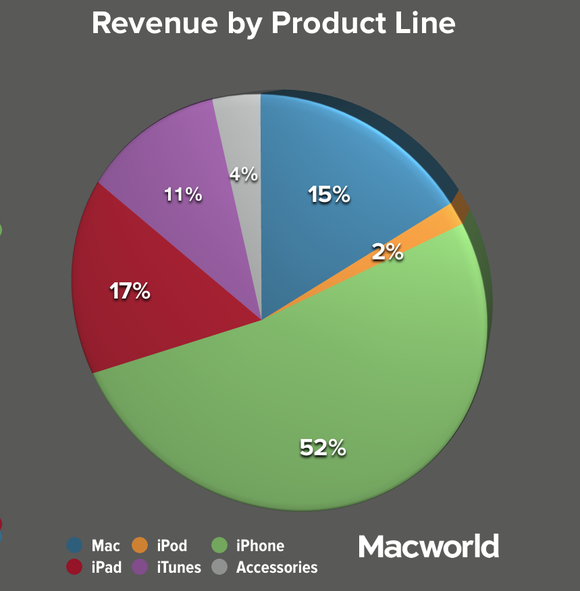 Compared to the same quarter a year ago, iPhone sales were up, iPad sales were flat, and Mac sales were down. Apple announced that its revenues in its fiscal fourth quarter (ending September 28) were up 4 percent compared to the same quarter in 2012. That was good enough to once again beat most analyst estimates. But year-over-year profits fell 8 percent. 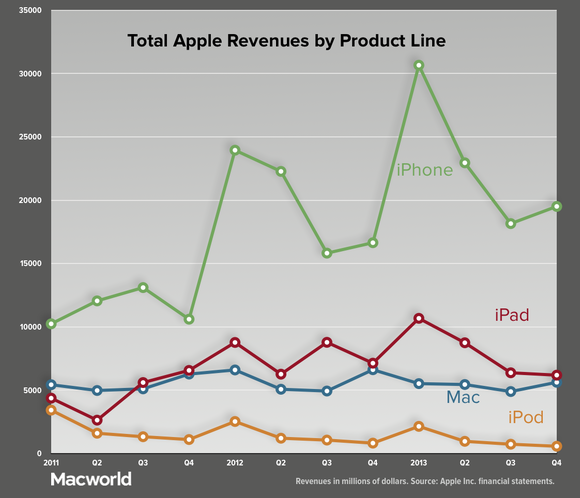 The iPhone continued to be the prime mover in Apple's fiscal world. The company said it sold 33.8 million iPhones—a record for the September quarter—compared to 26.9 million in that quarter last year. 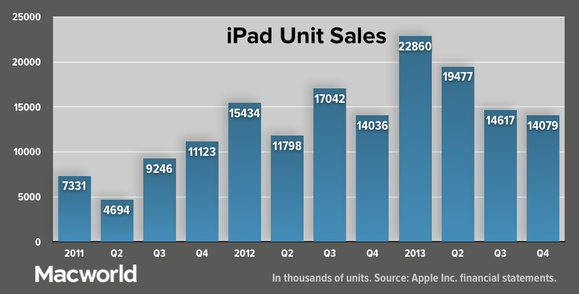 iPad unit sales were relatively flat at 14.1 million, up 100,000 from the year-ago quarter. And once again, Mac unit sales were down year-over-year, from 4.9 million in last year's fourth quarter to 4.6 million this year. 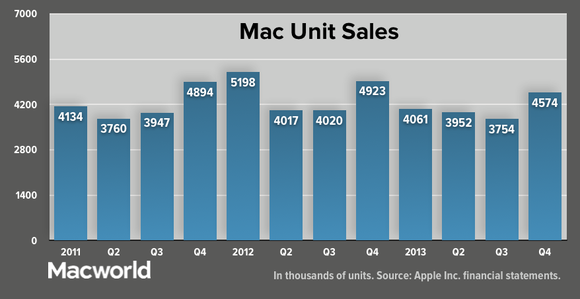 (Mac unit sales were lower every quarter this year compared to the same quarter the year before.) In fact, revenues from all Apple product lines except for the iPhone and for iTunes, software, and services were down year-over-year. The good quarterly sales for the iPhone were no doubt goosed by the introduction of the iPhone 5s and 5c, which famously sold 9 million units all by themselves in their debut weekend. The new iPhones were on sale for the last nine days of the quarter. Overall, iPhone unit sales were up 8 percent over the previous sequential quarter, and up 26 percent over the year-ago quarter. 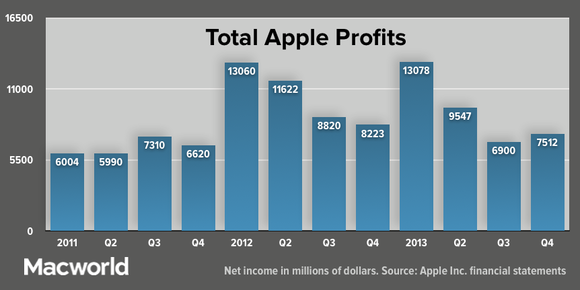 For the overall fiscal year 2013, iPhone net sales rose 13 percent (from $80.4 billion to $91.3 billion). 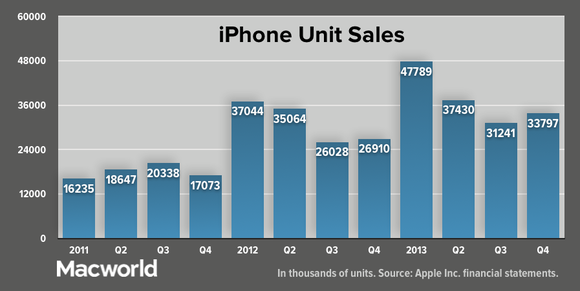 At the same time, iPhone unit sales climbed 20 percent (125 million to 150 million). Overall, iPhone sales contributed 53 percent of Apple’s revenues, up 51 percent in 2012 and 43 percent in 2011; iPhones contributed more than half of all Apple revenues in every quarter of 2013. 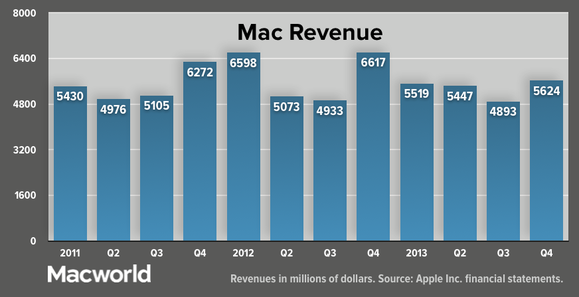 Mac sales actually declined for the fiscal year as a whole. Unit sales dropped 10 percent in 2013 compared to the 2012 fiscal year (from 18.1 million to 16.3 million); net sales fell 8 percent (from $23.2 billion to $21.4 billion). Remember that there were actually very few Mac product introductions in 2013, beyond some tweaks to the MacBook Air line. Yet, as Apple CFO Peter Oppenheimer pointed out in the conference call with analysts that accompanied the release of the results, the Mac has increased its share of the PC market in 29 of the past 30 quarters. In a rapidly shrinking market, a slow loss can look like growth. 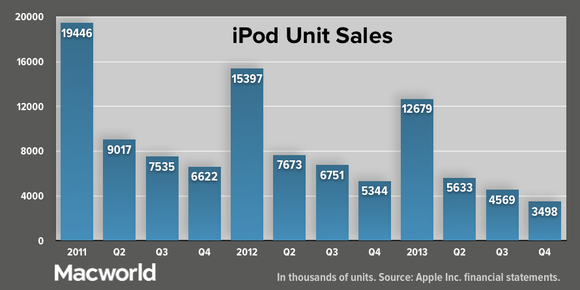 The iPod is still selling, but in such relatively insignificant quantities that it doesn’t even merit a mention in Apple’s earnings call. That could be because it’s contributing just 3 percent of Apple’s overall revenues these days. Much of Apple’s business is seasonal, spurred on by fall product announcements and massive holiday-quarter sales. But there’s one part of Apple's business that just keeps growing, quarter by quarter, seemingly impervious to seasonal fluctuations. 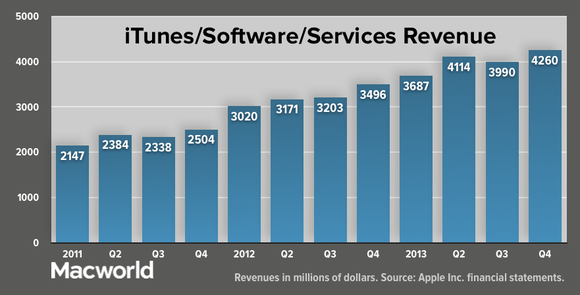 It’s the iTunes/Software/Services revenue line, which has grown more or less continuously every quarter. 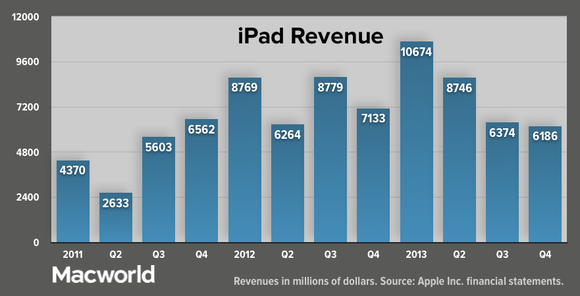 For the most recent quarter, it generated $4.26 billion, up from $3.5 billion in the year-ago quarter. 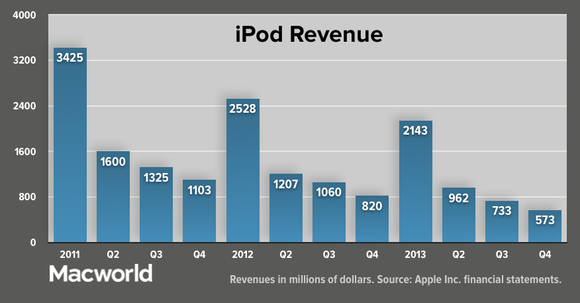 iTunes/Software/Services revenue has doubled in size in the past three years, from $2.15 billion in the first quarter of 2011. 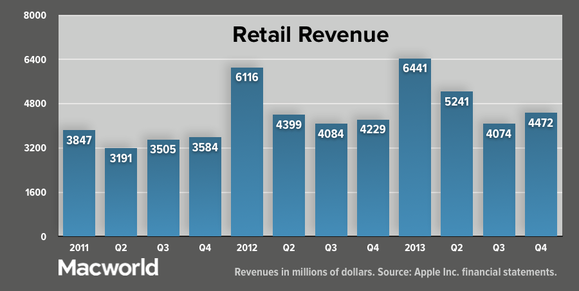 Apple’s retail segment is most definitely a seasonal business, but it’s showing slight growth. In fiscal 2012 Apple’s retail outlets generated $19 billion in revenue; in fiscal 2013 that number was $20 billion. During Monday’s conference call, one analyst commented that Apple was one of the very few companies he was tracking to show strong growth in China this past quarter. 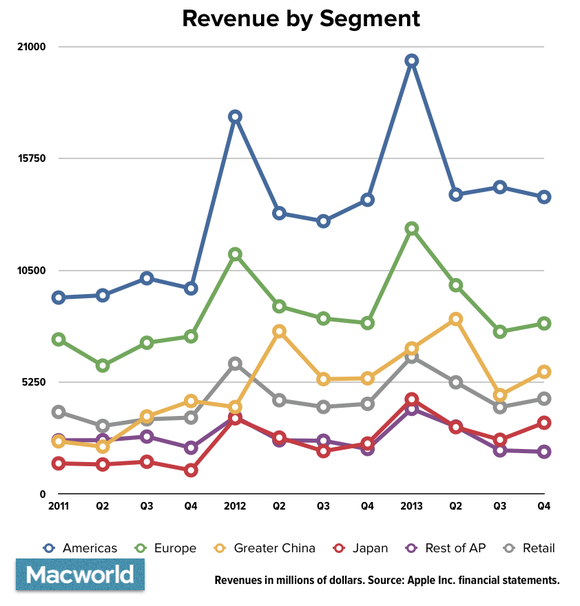 Indeed, while Apple’s revenue in the Americas was actually down from the previous sequential quarter, many other key Apple segments showed sequential growth, most notably China and Japan. For more on the company’s quarterly call with analysts, check out our transcript of Tim Cook’s comments. Updated repeatedly Monday 10/28 to add new charts and numbers as they became available.